Bloggers now are absolutely flooded with PR emails and press releases. Thankfully some of these are not to be missed, so I'll save up the best and share them sometimes. I also subscribe to every store mailing list. Doesn't seem right just to do single promo posts all the time? P.S. None of these are sponsored or anything, they just have my nod of approval (and longing and lusting to use!). I'm not too sure what Black Friday is and don't quite understand Thanksgiving, but I am thankful for the discounts! Blood is the New Black is offering 25% discount on all tees until December 1st with the checkout code 'TURKEYTROT'. Last Christmas I got the Balenciaga shoe tee by Brian Lichtenberg and their shipping to the UK was super fast! 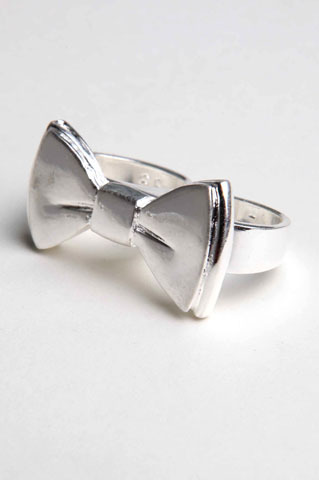 I just ordered the above two finger bow ring from Nasty Gal, which I've been eyeing for ages. Once you have this ring, you don't need to buy any other right? Enter "BLACKFRI" today (Friday) at the checkout for 20% off. Brit high-street store Warehouse is also offering 20% off everything for today only with the code "TREAT09". Simply Yours are throwing a lingerie designing competition open to students and all lingerie lovers, competing to design a fuller bust set for Spring/Summer 2011. Experience in the sourcing and production of your design too would be highly valuable; enter the 'From Brief to Bra' contest here. For £40 you can hire a designer dress from Topshop for two nights this Crimbo. You have to lay down a deposit and if like me, your Christmas celebrations are a messier affair, you may need to pass! But saying your Xmas ball dress once belonged to Kate Moss would be pretty cool right? Check the Glamour site for more info; I've linked to there because I like Leighton's hair on the cover this month, but I'm saving the magazine until the plane home next week!